It’s no secret search is changing. Just when you thought you understood everything about SEO, everything is different – again. Part of what’s driving this change is that Google has gotten smarter with their search engine algorithms. But part of it is also because there’s been a huge shift in the way people search for information online. What is clear, though, is that this new behavior means marketers need new ways to stand out, get noticed and add value. Now, though, searches have become longer, more conversational and more complex. According to Ahrefs, 64% of search queries today contain four words or more. And thanks to voice search devices like Siri and Alexa, we’re increasingly comfortable conducting searches using full sentences, such as “where should I eat dinner tonight” and “who can fix my computer”. But Siri and Alexa aren’t the only reasons people are submitting longer queries. For one, there’s a lot of content out there, and longer queries can help people sort through the junk and get the information they need faster. Not surprisingly, Google has been paying attention to this change – and Google’s response has several important implications for content marketers. Google’s first major step to address changing search behavior came with the Hummingbird update in 2013, which enabled search algorithms to understand phrases rather than just individual keywords. Google’s next big step was the RankBrain update in 2015, a machine learning algorithm designed to understand the context of searches. These two algorithm updates have changed the way search engines rank content, in order to produce more relevant results for users. For marketers, this necessitates evolving your content to match the evolving ways your audiences search for and find content. This includes changing up the way you structure your content, how you develop your content strategy and how you think about content creation. How? By building your content strategy around topics rather than keywords. We do this grouping keyword-focused content into topic clusters. Topics vs. keywords: What’s the difference? A topic is a broad concept. Keywords represent a component of that concept. Traditionally, blog posts are written to rank for specific, individual keywords, without much thought to how one keyword relates to another keyword on the same topic. This siloed approach to content often makes it hard for a user to find the information they need. Not to mention, it also results in your own URLs competing against each other in search engines when you publish multiple blog posts on similar topics. The solution to this problem is the topic cluster model: a collection of interlinked articles and website pages centered around one umbrella topic. Because the articles and pages link back and forth between each other, searchers can more easily navigate the topic and find better answers to their questions. This also provides you with more opportunities for search engines to find more of your content. 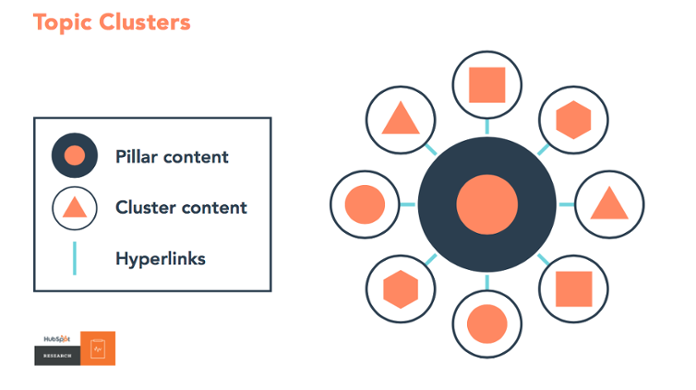 The topic cluster model consists of three components: a pillar page, cluster content and hyperlinks. Pillar pages are typically much longer than traditional blog posts. However, a pillar page doesn’t need to cover every single aspect of a topic. That’s what your cluster content is for. Your pillar page should answer the main questions your buyer personas have on a topic you want to “own” in the search engines. You can then create cluster content – additional blog posts and articles – that cover related or more specific aspects of your topic. You then link these blog posts and articles back to the main pillar page, creating an interconnected network of information and insights that acts as the definitive guide to that topic. A few months ago, I wrote a pillar page for Clariant Creative about B2B content strategy. The pillar page covers all the main points from what a content strategy is, why it’s important and the steps for developing your business’s content strategy. The final product is around 7,000 words. But as I wrote each section, I didn’t cover every single detail of every possible keyword related to B2B content strategy. Instead, each section I wrote covered an aspect of my topic broadly – and then I wrote additional blog posts to dive more deeply into each aspect. We can then link those related blog posts back to our main pillar page, and we’ll also link our pillar page to the blog posts as well. The end result is that we’re giving our readers the opportunity to dig into this topic and learn everything they need to know about creating an effective B2B content strategy for their business. Want an easy-to-follow guide for creating a pillar page? Download our free pillar page checklist! When considering whether a certain topic is broad enough for a pillar page, ask yourself a few questions. Would this page touch on every question the reader who searched [fill-in-the-blank] keyword has? And is the topic broad enough to be an umbrella for 15-30 blog posts? With all the changes to how people search online and how search engines rank and prioritize content, it’s imperative your content strategy is designed for this new reality. This means you really can’t afford to not create pillar pages and topic clusters. Improve rankings in search engines. When one page in your topic cluster performs well, this elevates the rankings for all other pages in your topic cluster that link to that page. Create a better user experience. Pillar pages and topic clusters enable visitors to find everything they want to know about a topic all on your website, instead of jumping between multiple websites to get the information they need. Build trust and thought leadership. By providing comprehensive information on a particular topic, visitors will see you as a trusted source of insights. Help sales reps qualify leads. Pillar pages draw in visitors and convert those visitors into leads. Your sales and support teams can also use this content to educate prospects, answer their questions and qualify leads. If you haven’t already started using pillar pages and topic clusters as part of your content marketing strategy, now is the time to start. But before you jump right in, you’ll want to take a closer look at how your content is currently performing. Download our free SEO Toolkit, which is packed with three valuable tools that will help you understand how well your SEO is performing for you.